Good to read what you wrote on the event,mineral engineers(particularly the youngsters) you met and about the industry persons. For me what you implied in between the lines carries a message on the future. I hope we take full advantage of the support we get from industry and serve the future needs of the profession in a more focused manner. This is what I feel from India. Yes, the Mineral Processors present were few compared to what shows up in other SME venues, especially when the meeting is in Denver. However, my count on those attending the MPD Plenary was closer to 75 (maybe 80 counting the photographer) than 30 --- sorry Barry, but I was counting from the front... And several drifted in/out. Overall, I enjoyed the meeting, exhibits and sessions. Barry, thanks for the comprehensive review of the event. Perhaps there were fewer people there but I certainly got a great feel for the event. And it was good that you caught up with such industry leaders as Glen D and Katherine and of course, Chris Fleming. Thanks Jerry. I have just heard from SME that the final number was 5083, the lowest for the best part of a decade. In 2015 there were 7800 in Denver, 6500 in Phoenix in 2016 and last year 6300 in Denver. 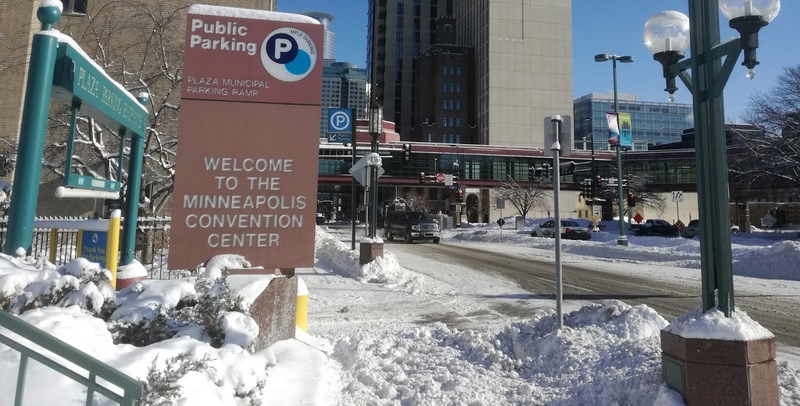 The steady decrease in numbers can be accounted for by the state of the industry, exacerbated this year by Minneapolis as a venue. This was not a popular choice, but I found the city to be attractive, and the convention centre and local accommodation were of high standard. It was a real pain getting to Minneapolis, however, from UK, necessitating a 6 hour stop in Chicago. The industry is improving and next year we will be back in Denver, so I am hoping for big numbers again in 2019. February 27th witnessed this year’s version of the annual SME Scotch Nightcap fundraising event to provide scholarship assistance to new students. Similarly to last year’s event in Denver, the 2018 event, held in the ballroom of the Hyatt Regency in Minneapolis, featured traditional Scotch tasting accompanied by live music which was once again provided by Bass Metals. Bass Metals dubbed this year’s event ‘The British Invasion’; While the core of the band was as last year - featuring Dave Meadows, Bechtel Mining and Metals and Joe Mercuri from CiDRA supported by John Marsden of Metallurgium and Nick Hazen of Hazen Research Inc, the band were joined by two ‘Brits’ who provided the rhythm section - Rob Walbourne on drums and Dave’s brother John on bass guitar. The band played two sets of music. The first set featured ‘unplugged’ versions of some classic rock along with a mix of mellow ballads and blues. The second set was a powerful tour de force featuring some of rock’s finest anthems and allowing Mercure and Meadows to display their vocal and guitar playing talents respectively. A rousing finale to the gig featured yet another guest appearance and some mean axe playing when the band were joined on stage by Joe Dziedzina of FL Smidth. Thank you to one and all for your support! Barry, Thanks a great summary. It is always good to see you. This year I had a pleasure to award the SME Antoine Gaudin to Prof. Kevin Gavin. He and his team have done a great job at redefining flotation by using fundamentals engineering principles such as the two phase flow, Kynch Theory, Yoshioka operating diagram and Richardson-Zaki suspension model. It was a great validation to our Dynamic Flotation Model where both the hydraulic components and particle-bubble attachments are modelled in parallel. The Reflux Flotation Cell incorporates these physical concepts for the separation of complex minerals with lesser space and operating costs.